Persistent dry weather has grown more worrisome in the American West, with nearly two thirds of the region experiencing some level of drought. By most measures, the state of California is suffering through the worst of it. 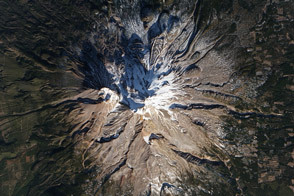 The effects of the dry spell are visible in the mountains, where snow pack is lacking, and now in the vegetation cover on the landscape. 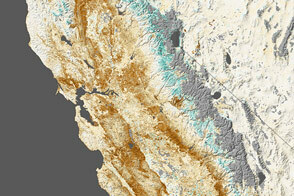 Nearly all of California was in a state of extreme drought at the end of January 2014. The past three months (November to January), six months (since August) and twelve months were all the driest periods in California since record-keeping started in 1885. From February 1, 2013, through January 31, 2014, a statewide average of 6.97 inches (177.04 millimeters) of rain fell; the norm is 22.51 inches (571.75 millimeters). 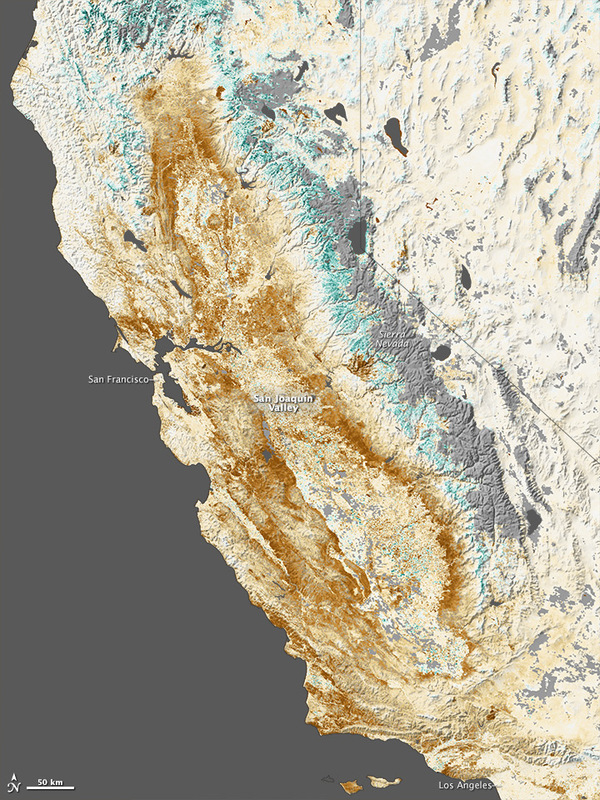 The map above shows the impact of drought on California’s farms, forests, and wild lands. 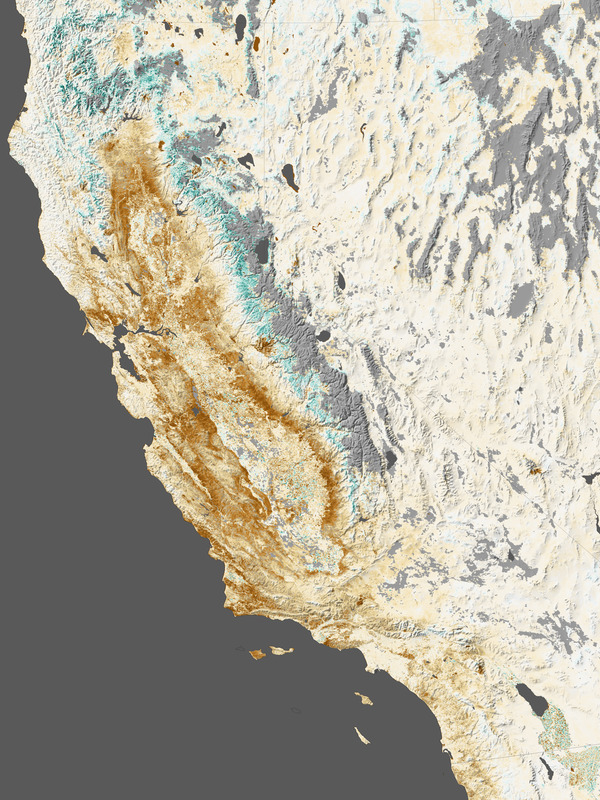 Based on data from the Moderate Resolution Imaging Spectroradiometer (MODIS) on NASA’s Terra and Aqua satellites, the map contrasts plant health from January 17 to February 1, 2014, against average conditions for the same period over the past decade. Shades of brown depict where plant growth, or “greenness,” was below normal for the time of year; shades of green indicate vegetation that is more widespread or abundant than normal. 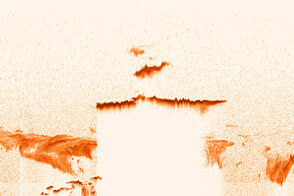 Grays depict areas where data was not available (often due to cloud cover). The map is based on the Normalized Difference Vegetation Index (NDVI), a measure of how plant leaves absorb visible light and reflect infrared light. Drought-stressed vegetation reflects more visible light and less infrared than healthy vegetation. 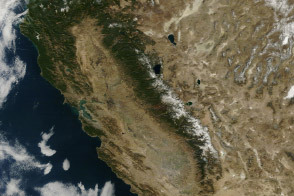 The coastal mountains from north of San Francisco to south of Los Angeles are snow free and dry, as is much of the Sierra Nevada. In the midst of California's Sacramento and San Joaquin valleys, there are a few patches of green indicating some farms that still have access to water for irrigation. But much of the region is brown—signs of land suffering from drought stress or left fallow when it would normally be planted with crops. 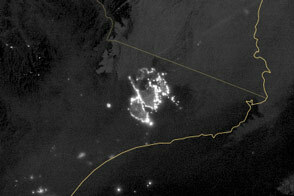 NASA Earth Observatory image by Jesse Allen, Earth Observatory, using data provided by Inbal Reshef, Global Agricultural Monitoring Project. Caption by Mike Carlowicz. 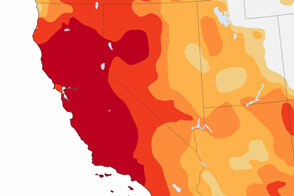 National Drought Mitigation Center (2014, February 11) U.S. Drought Monitor. Accessed February 13, 2014. 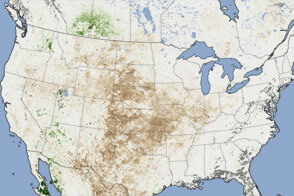 NOAA National Climatic Data Center (2014, February 13) State of the Climate: Drought. Accessed February 13, 2014. 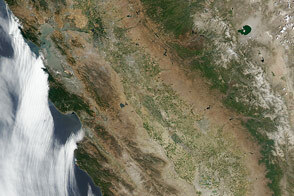 NOAA National Climatic Data Center (2014) Climatological Rankings: California. Accessed February 13, 2014.